Living in America has had its benefits since we moved here two years ago for my husband to pursue education to be a pastor. By living here we’ve had the amazing privilege of being able to go to some of the most incredible national parks in the world! We have walked amongst (and even driven through, literally) the giant Red Wood trees and got to witness the Old Faithful Geyser erupt in Yellowstone National Park. 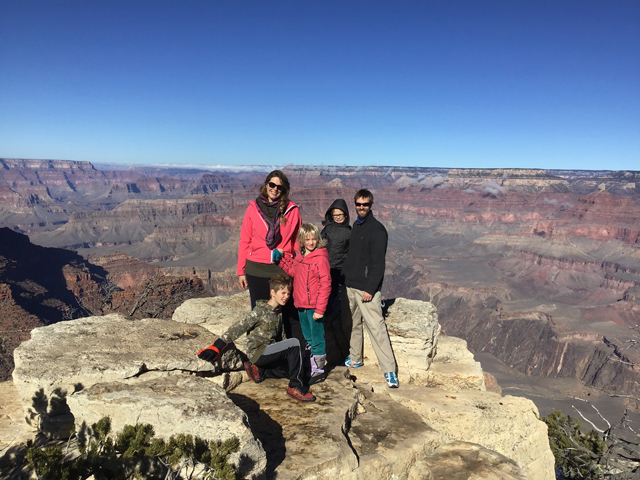 Recently, we were blessed with the opportunity of going to one of the natural wonders of the world and one of my bucket list items… the Grand Canyon. I don’t think pictures can ever do it justice, it is truly breathtaking. When you look at pictures you don’t get a sense of the depth or the dimensions or how small you are compared to this vast canyon, with its sheer size, colors and total dimensions. As I walked towards the Canyon I was not prepared to be overtaken by it, so much so that as I was talking to a friend I actually had to stop because I was just enamored with the beauty of God’s majesty. I not only got to see the Grand Canyon but was able to go on a Christian Ministry Tour and have the guide explain to us from a biblical perspective what happened in the Grand Canyon and why it looks the way it does. All which made me more in love with my creator. It is a challenge being a Christian in such a secular world and more specifically a Christian who believes that the whole Bible is true. This means that I hold to the actual 6 days of creation account that the Bible begins with in Genesis. Believing in creation makes it very hard when all the national parks and museums hold to an old earth theory. A theory, that in my opinion, takes much more faith to believe in, than an awesome and all-powerful God who created the whole world in 6 days, that He made men, monkeys, mountains, the seas, and everything else before He rested. The guide showed us base rock in the canyon, which is the foundation rock that is found in day 3 of creation as Genesis chapter 1 verse 9 and 10 tells us “… and let the dry land appear.. and God called the dry land Earth.” And explained the different types of layers you find on top of the base rock. The guide asked us “what do you see when you look at the canyon?” Most of us replied “God’s creation!” However, he immediately reminded us that we are not looking at creation, but rather God’s wrath and redemption. The Grand Canyon was not created during creation, just like all of what we see. The original creation was destroyed with the flood and everything we see now is a result of a post flood world. What the guide said next floored me “if God’s wrath looks this beautiful, imagine how beautiful heaven must be like.” If God can use his wrath to make such a beauty, it is no wonder that John could not write all that He saw in the book of Revelation. The text books explain that the Grand Canyon was made over millions of years as the ocean rose and fell, leaving behind layers, yet that can’t explain why the layers of sediment are even and similar across the world. That theory is seriously flawed as they say that in the bottom layers of the canyon you should find no fossils or little tiny ones of the evolutionary chain and the higher you go the bigger more complex fossils you should find. But all you must do is dig into the layers of the Grand Canyon and you will see that each layer holds hundreds of different sized fossils. You can find giant dinosaur fossils at the bottom, which technically should be an impossibility. God did not create the Grand Canyon over millions of years while cells evolved. It was only a few thousand years ago when God’s wrath came, yet out of that wrath came much beauty. God sent a flood (read Genesis Chapter 6 through 8) which destroyed the whole earth as water covered the world and it rained for 150 days (yes, not just 40) as found in Genesis chapter 7 verse 24, burying everything that once breathed. All except the 8 people and the animals that were in the ark. It wasn’t just that it rained for 40 days and nights, but rather that it rained for 40 days until the arc began to float Genesis 7 verses 17-19. Then it continued, and the water of the deeps were open. Rain was coming down as the very crust of the earth was opening, tsunamis, earthquakes, the earth was being devastated and would never look the same as the evil of man was being judged. The Grand Canyon echoes God’s heart of redemption, that he would take something that was caused by sin and turn it into beauty and something that points to Him. We can now go and stand before the canyon, look out and see its beauty, and remember our God is a redeeming God. In fact, the picture of the Grand Canyon is a foretaste of the future, for God will again bring global judgement against all ungodliness (as He did at the flood) and form a completely new heavens and earth that is beautiful beyond our imagination. True Christians will take part and forever dwell with God in this new creation, anyone and everyone else will be condemned to eternal judgement in hell.